DESCRIPTION: This is the definition of a "hidden gem." 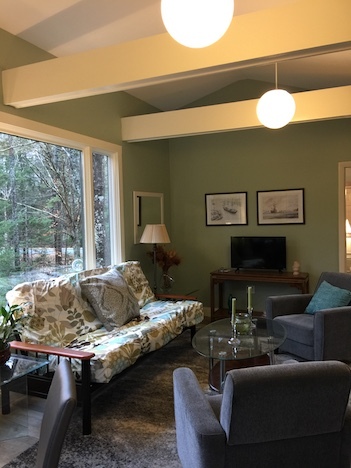 Newly renovated garage apartment which is beautifully furnished and located only a short stroll to Pond's End on Long Pond, its launching ramp and swim dock, as well as National Park Canoe & Kayak rentals. Off street parking offers room for your trailer and boat along with private access to Somesville Landing on Somes Sound. This gem is the perfect getaway retreat for a couple looking to unwind after a long day of exploring Acadia National Park. 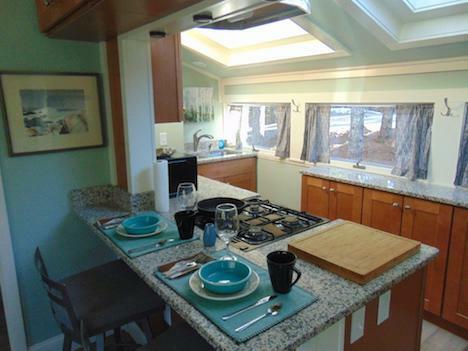 Its centralized location on Mount Desert Island means you are never far from everything MDI has to offer! LAYOUT ONE LEVEL UPSTAIRS: Up a few stairs, you will enter a very modern and tastefully decorated open concept living room, dining area and fully equipped kitchen. Bedroom with a queen bed and en-suite bathroom with standup shower. The living room does have a full-sized futon for an occasional guest. 4 night minimum considered in May, June, Sept. & Oct.
is located on the same property as the owners main house. WINTER RENTAL: Avail for the '19 - '20 season.